Wear a reminder of a beach that holds a special place in your heart with this sand-filled bracelet. Whether you're partial to an island you call home, a favorite summer vacation destination, or the beach where you took your wedding vows, Holly Daniels Christensen's meaningful bracelet is a way to honor the shores that hold a special place in your heart. 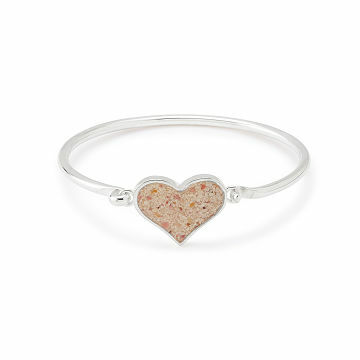 To craft each piece, Holly puts a pinch of sand—gathered from your choice of one of thousands of picturesque world beaches—into a heart-shaped silver plated brass bezel and seals it with jewelry-grade resin. Select a place from Holly's sand bank, or send in sand you've collected from an unforgettable spot. Handmade in Massachusetts.